At the beginning of 2016 I, together with Joan Johnston and Joanna Crilly, purchased EQUITANAs Firlefranz from Wilhelm Holkenbrink and Ralf Konermann. Firlefranz is a very eye catching chestnut with his flaxen mane and has lots of presence. He is a modern elegant type, attentive and awake yet very calm. He is light on his feet, very well balanced and moves smoothly with elasticity. As a 3-year-old he spent a lot of time out in the field and was slowly introduced to everything we do here. In 2017 as a 4-year-old he experienced his first competition. 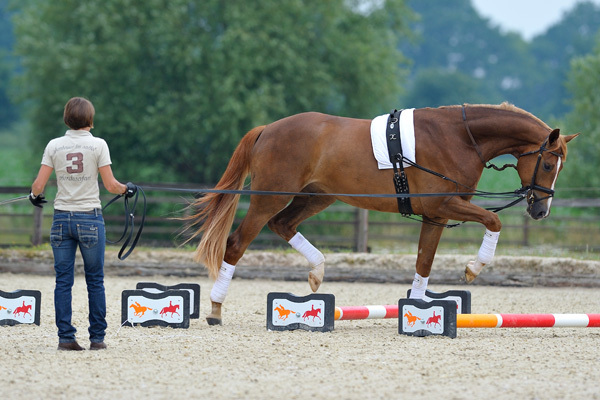 As well as placings in dressage horse and jumping horse classes at Novice level, combined dressage tests with cross country jumps afterwards, he has also won riding horse tests. In Münster in front of the castle he had a fabulous win, going home as the Westfalen 4-year-old ridden horse champion. 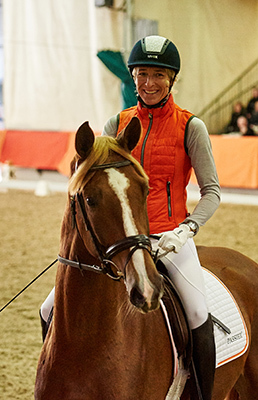 As a 5-year-old Firle won a dressage horse test at elementary level, thereby qualifying for the 5-year-old Dressage Horse class at the Bundeschampionat. He loves being ridden out regularly in a group and jumping cross country.